Limited Liability Company “Law Firm “Konstanta” has being established in 2007 as a partnership of lawyers from Omsk State University. Qualified lawyers are part of the staff of our company, they have both a high theoretical level of knowledge and rich practical experience. Our employees teach legal disciplines in various universities in the city of Omsk. The partner of our company Kotelevskiy Denis is Candidate of Legal Sciences, Associate Professor of the Law Faculty of Omsk State University. He is also a former member of bar association (advocates) of Omsk region. Limited Liability Company “Law Firm “Konstanta” propose a wide range of legal services for organizations in the field of civil and tax law. Our approach to work is characterized by a high degree of creativity and is not limited to one only formal fulfillment of obligations. We try to use all possible resources and ways to solve the client’s problem, while remaining in the legal field. In our work we widely use high-tech tools, which in particular allows us to respond quickly to client requests. So, the personnel of our company can be accessed both with the help of traditional means of communication, and using the Internet.The company is located and operates in Omsk. Also we have representation in Kaliningrad, Perm and Novosibirsk. Kotelevskiy Denis is a founding partner of our company. 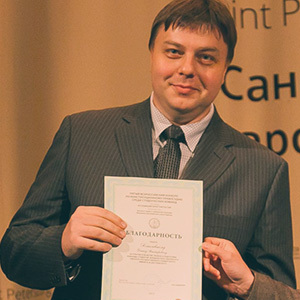 He is Candidate of Legal Sciences, former Associate Professor of the Law Faculty of Omsk State University. He is also a former member of bar association (advocates) of Omsk region. Kotelevskiy Denis is a member of Rotary International, Paul Harris fellowship and past president of Rotary club “Omsk”.